She is a wonderful musician and a natural, gifted leader. She directs with passion and commitment. Every rehearsal is injected with her enthusiasm and positivity – and this is shared amongst the players. Jackie’s attitude in rehearsals is serious and fun. 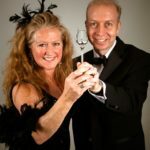 She skilfully and respectfully handles all our different personalities – things can get very heated when we are under pressure preparing for a performance with limited rehearsal time. She will steer everything in the right direction, often with humour, taking everybody on board. The culminating concerts, the success of which she is utterly committed to, always feel like a real collaboration of our work and ideas. Jackie is a special person. We are lucky to have her! Jacqueline’s musical credentials and spirit embody the artistic ethos of Britten Sinfonia; a collaborative chamber musician of pure class and quality, hungry to embrace a wide range of music and collaborations from across the musical spectrum. It must be palpable to audiences watching and listening, how much she is adored by the orchestra and the many collaborators we’ve worked with over these years, and there’s no doubt that her artistry, inspiration and pure unfettered love of the music we play, has had so much to do with the orchestra’s happy success over these years. Jackie Shave is a musical force of nature. She has led and directed Britten Sinfonia over the last ten years with a magical combination of warmth, passion and inspirational music making. She ignites every project she undertakes. Her direction of Bach’s St. John Passion was a triumph of unashamed emotional commitment combined with technical mastery. It was a highlight of my musical career and a privilege to participate. Jacqueline Shave is simply one the most inspiring musicians I have had the privilege of sharing a stage with. Britten Sinfonia is deeply collaborative but in the end we would follow her anywhere without question. The Bach St. John Passion she directed was a deeply moving experience for us all and a 3-year journey for her. I will simply never forget it. She led the same piece for me at Dartington last summer with amateur forces and was equally as inspiring. 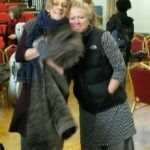 I’ve learned so much from sharing a desk with Jackie over the years in Britten Sinfonia – her unfussy leadership style, flamboyant musicality, and her special ability to deal with stressful situations by relaxing everybody around her. With leaders as good as Jackie, who needs conductors? As ever this season, Jackie has been a real inspiration through her fabulous musicianship and unparalleled ability to encourage each member of an ensemble to give of their best. Britten Sinfonia is propelled by her into meteoric flight in any given genre or period of music, taking the audience with her. She’s such a fantastic leader – she’s very charismatic. You can tell that she’s thinking about so much more than just the notes. This April and May Britten Sinfonia tours a programme specially curated by Jacqueline to celebrate her ten years at the helm of the orchestra. 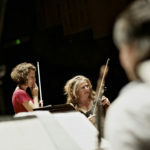 With performances in Wiltshire, Cambridge, Norwich and London the concerts feature a Bartok string quartet movement, a Mozart piano concerto with soloist Benjamin Grosvenor, Strauss’ Metamorphosen and the world premiere of a new work by Elena Langer, commissioned and written especially for Jackie. Find out more here. In both Norwich and London, Jacqueline will discuss her role as leader/director with Fiona Maddocks in a special pre-concert talk.